Sturtevant says he was forced to keep up with spending by opponent Dan Gecker in the District 10 race. 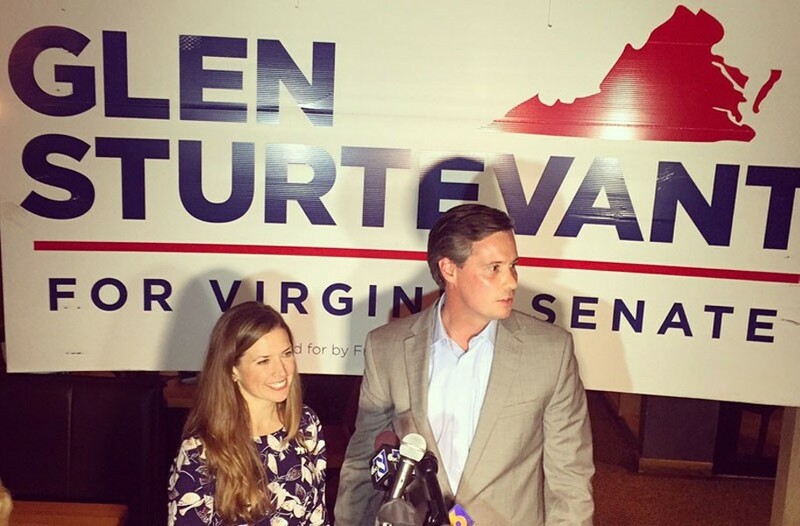 Ash Daniel State Senate-elect Republican Glen Sturtevant stands with his wife Lori after his election win. Sturtevant is now asking supporters for more contributions following the election. Just over two weeks after the elections, Republican state Senate elect Glen Sturtevant, is asking his supporters to fork over more cash to make up for campaign spending. A mass email issued by his campaign says that he would have taken on less debt if his opponent Democrat Dan Gecker, didn’t outspend him by $1 million during the District 10 race. The email also indirectly refers to the $700,000 ad buy on Gecker’s behalf, by the Michael Bloomberg backed Every Town for Gun Safety – which brought gun safety issues to the forefront for both candidates. In the ad, the parents of slain Roanoke journalist Alison Parker propelled their status as gun control advocates when they called for tougher gun control measures. In total, Sturtevant spent $1.3 million to Gecker’s $2.3, as indicated by the Virginia Public Access Project. Independent candidate Marleen Durfee spent just over $10,000 and Libertarian candidate Carl Loser spent $5,324.